Fri. 10-11:30am, and by appointment. My research interest lie mostly in number theory. In particular I study automorphic forms and the underlying representation theory, as well as modularity of the associated geometric objects. I'm currently working on several methods for computing Siegel paramodular forms. For more details see my CV and my research statement. Rupert, M. (2017). Local Test Vectors for the Theta Lift from GSO(4) to GSp(4). In preparation . Rupert, M. (2016). The Erdos-Kac Theorem for Beurling Primes. Submitted to INTEGERS Electronic Journal of Combinatorial Number Theory . Chappman, H., Rupert, M. (2012). A Group-theoretic Approach to Human Solving Strategies in Sudoku. Colonial Academic Alliance Undergraduate Research Journal, Volume 3 Article 3. I gave a short talk at the Automorphic Forms Workshop in Ann Arbor in 2015. I presented a poster at the University of Idaho, Student Research Expo in 2015. I use bblearn for my course web pages. I am co-organizing an MAA Special Session on experimental methods in teaching coding theory, cryptography, and number theory that will be part of the Southeastern Sectional meeting on March 23rd and 24th, at Clemson University. I was a senator in the Graduate and Professional Student Association of the University of Idaho. I searved on the travel awards committee. I was co-chair of the Math Learning Center Committee at the University of British Columbia. I just started my postdoc at Clemson in the Fall of 2017. I am a part of the research training group in coding theory, cryptography, and number theory. 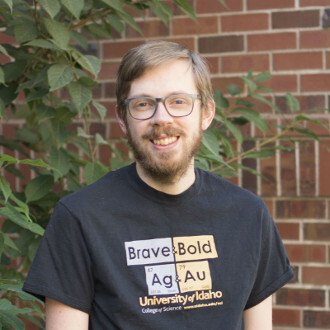 Before that I was a graduate student in the Department of Mathematics at the University of Idaho since 2013. Before attending the University of Idaho I recived my masters in mathematics from the University of British Columbia, under the advisement of Greg Martin, and my bachelors in mathematics from Western Washington University.